I'm swinging in today to share another fun Halloween card with you! Yep. I'm playing around with those fun Halloween Owls again!...Don't you just love these guys? 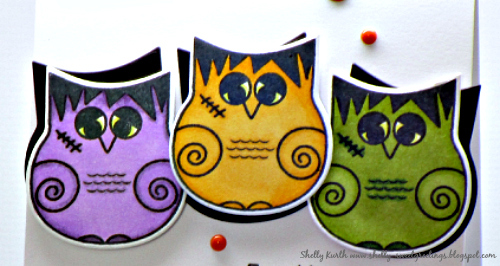 !...I used the Happy (OWL)oween stamp set, along with the Owl Duo die. I started by stamping my images and then coloring them with markers. After, I used the die with them as well as using the die with solid black cardstock. Once done, I added some foam tape on the back of my colored owls and added them to the solid black owls. Which I had some fun with and just chose to have the black pop out here and there. Fun, yeah? !...Before adding them to my card, I added my sentiment. To finish things off, I added a few orange enamel dots. Thanks so much for stopping by! Enjoy your Friday and weekend! this card is so fun.. i love it..
Awww, these are just beyond adorable!!! absolutely love all the cards you have made with this cute set!! this one is fabulous! Beautiful project...I just love that owl. Shelly, your owls are simply wayyyy too much fun! Fabulous card!